Territorial Savings Bank is pleased to announce their Chairman’s Club Members. These are employees who achieved outstanding mortgage performance for the 4th quarter. 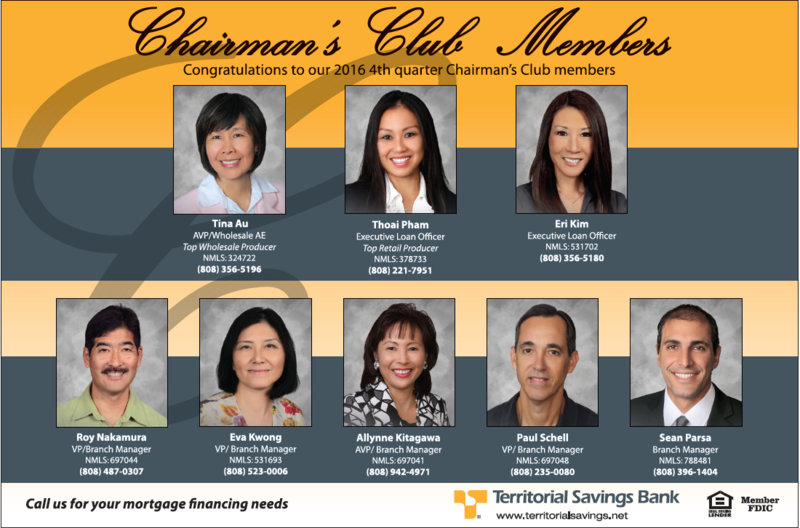 The Chairman’s Club Charter Members are: Thoai Pham, Executive Loan Officer; Roy Nakamura, VP/Branch Manager, Pearlridge Branch; Eva Kwong, AVP/Branch Manager, Nuuanu Branch; Eri Kim, Executive Loan Officer; Allynne Kitagawa, AVP/Branch Manager, McCully Branch; Paul Schell, VP/Branch Manager, Downtown Branch; Sean Parsa, Branch Manager, Hawaii Kai Branch; and Tina Au, AVP/Wholesale AE. Exclusive offers for our Territorial Savings Bank customers. Statewide branches to service you on Oahu, Maui, Big Island and Kauai. Talk to a real person when you are in need of assistance for all your banking needs.